For the last two years the Washington Capitals‘ Toy Drive has collected toys for the U.S. Marine Corps Toys for Tots Foundation, and this year JK Moving Services is substituting for Santa’s sleigh and reindeer by providing a 17′ truck to move the presents to the Toys for Tots Warehouse. 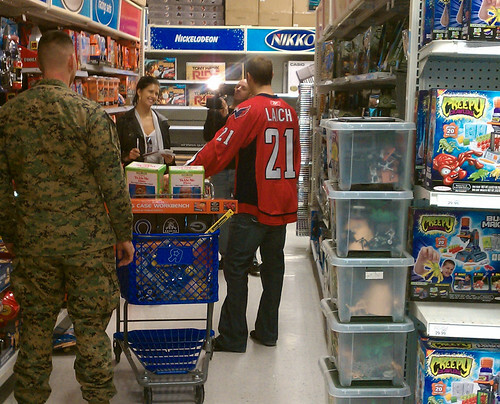 On December 7th Washington Capital’s center Brooks Laich, the GEICO Gecko, Caps alumni, Comcast SportsNet’s Alan May and Elliot Segal from DC 101’s Elliot in the Morning all shopped for toys at the Toys “R” Us in Bailey’s Crossroads, Virginia. This event kicked off the Caps 2010 Toy Drive and will be followed by an event at the Verizon Center where it is expected that well over 2000 fans will donate toys in exchange for a free poster of Laich. When Santa was faced with no way of transporting so many presents in his sleigh, JK Moving Services stepped up and offered to transport all of the presents to a local warehouse. Learn more about how you can get involved with your local Toys for Tots organization by visiting their website. Happy holidays!